It’s not that we’re trying to toot our own horn, because we’re not. It’s just that we deal with stressful situations on a daily basis. You see, short sale orchestration is HARD WORK! And when you work in a combustion chamber five days a week (sometimes six) like we do, sometimes you just gotta let your hair down and have fun…and that’s exactly what we did at the 2012 Florida Realtors® Convention and Trade Expo. We actually started planning for the convention months in advance because we knew that we wanted to GO BIG. As you can tell from the photo above, our theme was “Ride the Title Wave of Excellence.” We chose this theme because the overall theme at the convention was “Good Vibrations” as you’ll see in the video below. Is your property under water? Do you owe more than your property is worth? If so, you might not have been able to take advantage of the historically low mortgage interest rates that exist in our market right now. Most traditional home loan programs require an appraisal, which your lender uses to determine the value of your home and to determine whether that value makes it a safe bet for them to loan you money. Very basically, if your home is worth less than you owe on it is essentially impossible to refinance your current loan. This is of course a common problem here in Southwest Florida. If you are currently in a FHA home loan and in this situation, there is a program that may help you take advantage of today’s great mortgage intersest rates. It is called the FHA Streamline Refinance. Just last week, we closed one of these loans for a couple who owed $240,000 on a FHA loan and who were paying about 5.5% interest on that loan. Their home’s value was recently assessed by the property appraiser at $190,000 ($50,000 less than what they owed! ), which in most cases would have made it impossible for them to refinance their home loan. Through the FHA Streamline Refinance program, these “under water” clients were able to refinance at a fixed rate of 3.75% over 30 years, which reduced their monthly payment of principal and interest from $1,363 to $1,109.49 – a savings of over $250 per month! The FHA Streamline Refinance is a unique special provision. For starters, your existing loan must be a FHA loan. According to mortgage expert Jay Beckingham, a loan officer at American Eagle Mortgage Company in Ft. Myers, Florida, FHA wants its borrowers to be able to take advantage of today’s low rates. The program therefore requires NO APPRAISAL, instead using the property’s purchase price as a baseline. The program does require that you pay your own closing costs; but the long-term savings are nonetheless clear and significant. In the example above, those clients will save over $3,000 over the next 12 months. If we can help you in anyway, please be sure to contact us online, or give us call at (239) 985-4142. It’s that time of year again when thousands of us from the sunshine state’s real estate industry flock to the Florida Realtors® Convention & Expo, just like our northern neighbors flock to our state, annually. We will definitely be there! 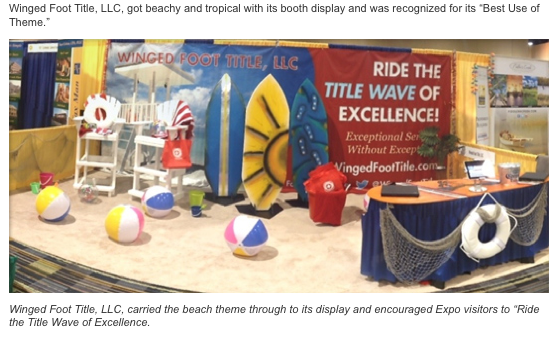 In fact, this is our second consecutive year in which Winged Foot Title will be exhibitors at the expo. We’ll be in booths 420 and 422 at the Expo on Thursday and Friday (8/9 – 8/10); and a few of us will be at REBarCamp on Wednesday, 8/8. Coming from Southwest Florida – virtually the epicenter of the housing crisis – and starting our business when we did – January, 2007 – gives us an interesting perspective. We struggled mightily at the outset and were fortunately lean enough to survive. We survived long enough to establish a very high quality and well-respected brand, and began to grow our market share by innovating. Most of our success and growth over the last two and half years has come from the development of a short sale orchestration department. We call it lien clearance or title processing on steroids, and we currently employ four full time people whose responsibility it is to work with REALTORs, short sellers, and their lenders to get the lenders in short sales to provide a lien release so that we may issue title insurance. Our team recently discussed this suite of services and, in light of what we have seen in the market – slight increases in values, e.g. – we would like to see our short sale work comprise a much smaller percentage of our revenue in about one year. We are therefore ratcheting up our sales and marketing focus on more traditional work (settlement and closing services) driven from lenders on the refinance side and from REALTORs on the purchase and sale side.